Every year we sit down and review hundreds of running backpacks and come up with the best packs for that year. Well, it’s now time for the 2016 list and we’re like a bunch of kids the night before Christmas. Before we get to the list, we want to add a little disclaimer. 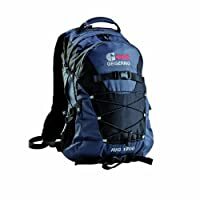 If you go to Amazon and type in “running backpack” you’ll notice there are over 10,000 results! Now, obviously they aren’t all running packs, but you get the point. There’s a lot of backpacks available. So, when you take a look at the list below know that the difference between the #1 bag and the #10 bag is very minimal. Some people buy based on price, others on brand, others on features, and so on. Regardless of which pack you end up with this list is bulletproof. First off, if this is your first running backpack purchase then we recommend you read our buyer’s guide. It’s a brief guide that will walk you through some information that you may not have considered. Comfort and Fit. We look at things like shoulder straps, chest straps, waist straps, breathability, padding, and so on. Hydration. Here we like to see if they include a bladder or if there is specific space for a bladder and typically like to see some type of holster for a bottle as well. Storage. We love storage. Sometimes we run with our tablet, extra change of clothes, lunch, snacks, first aid kits, etc. It’s not just about having a ton of storage though. It’s about having the right size compartments and ease of access. Of course there are other features that may catch our eye, such as rain flys/covers, innovative systems (like the Geigerrig “hydration engine”), or the ability to handle pack add-ons. But for the most part we look at the criteria above. We don’t consider price when we’re choosing our top 10, but you will notice a price chart in the table. You’ll notice that a higher price doesn’t always mean a better pack. Note: At the time of writing this, the top 2 packs were less than $50! That is absolutely insane (and awesome). Price for this awesome pack is extremely low compared to others in this category. Dimensions: 18″x9″x8″ (or 13 liters) and available in 11 colors. Built in external hydration reservoir pocket. Comfortable Backpanel & Internal Laptop pocket. Free 2 Litre Hydration Bladder Included & has many storage pockets. Fully adjustable in the shoulder, chest, and waist belt for a customizable fit. Available in 5 colors & Limited lifetime warranty. Includes a 100 oz. bladder. Hydration Engine - Pressurized hydration pack. Ventilated back panel and a sliding sternum strap. Exterior side mesh pockets and bungy storage system. Heat embossed scratch-free slash pocket - Keep your sunglasses and other items safe. Side stretch mesh pockets provides additional storage options. Blinker light attachment - Stay seen and be safe in the dark. Internal sleeve to hold a hydration reservoir. Detachable Waistbelt and sternum strap. Mesh back is soft, breathable and lightly padded for comfort. Hydration compartment contains a 2.5-liter Hydraulics LT reservoir. Helmet Attachment Loop & Blinker Light Attachment. Integrated, removable raincover protects your pack in adverse conditions. Breathable Foam Back & easily removable hip belt. Valuables Pocket - Special Pocket inside to store valuable items. Hydration sleeve with external access. Features an expandable stretch front pocket. Hydration compatible with external-access hydration sleeve. Hipbelt pocket, front compression stretch pocket and side stretch pockets. Shoulder straps are linked by cable - Helps to maintain an even, balanced load across the shoulders. In case you didn’t notice, Osprey holds the #1, #4, and #7 spots on the list, and we probably could have added the Osprey Stratos 24 too. The Good. First and foremost the price for such an awesome pack is extremely low compared with other packs in the category. Coming in at 18″x9″x8″ (or 13 liters) the pack holds quite a bit for such a compact size. We were able to pack almost 2 days worth of clothes, a few snacks and an ASUS tablet. Oh, and did we mention it comes in 8 different colors? The Bad. The pack is built with tuck away mesh shoulder straps, which were great, but we kind of wish they had a little more padding. Although we were able to put a lot in the Daylite, if it were about 5 liters larger it would have been ideal. The Bottom Line. All in all the pack is built with extremely high quality and purpose. This is the perfect day pack for runners, but don’t expect it to be more than that. The Good. TETON makes an incredible sales pitch by including a 70 oz. hydration bladder, which makes it perfect if this is your first running pack. In addition the pack boasts tons of storage pockets. Again we were able to fit a 10.1″ ASUS tablet in the pack with no problem, along with a change of clothes, and the full bladder. It also seems like it’s built for the outdoors, so if you’re planning to use this for more than running you’ll be in good shape. The Bad. It was tough to find something bad about the TETON Sport Oasis. The only thing we could find is the limited color options (just black, green, orange). The Bottom Line. For the price and the hydration bladder this is probably your best first pack. It’s an 18 liter pack versus the Daylite which is 13 liters. So, if you’re trying to determine the best 2 packs, go with the TETON if you need a slightly larger bag and the Daylite if you want a little more compact. The Good. Geigerig includes what they call a “hydration engine,” which is essentially a pretty awesome a pressurized hydration pack (we haven’t met anyone that doesn’t love this). They also include a 100 oz. bladder. The Bad. The pack is a little more heavy-duty than some of the others on this list. So, if you’re rough on your gear that’s a good thing. However, for us it ran a little “hot.” Some more open mesh on the shoulder straps or back would add a bit of breathability. And unfortunately it is also the most expensive on the list (by a lot). The Bottom Line. The Geigerig 1200 is the largest of the top 3. It comes in at 19.8 liters and is an awesome bag, especially with their “hydration engine.” You can’t go wrong here. So, that’s it. Be sure to let us know which pack you end up going with and if you think we left any off our 2018 list!